This nativity set offers two different but complementary views of Christianity. We have to the right the traditional Christmas scene enlivened by music and dance. On the left side we see a procession reminiscent of Corpus Christi. Both of these scenes have an unmistakable Roman flavor. Costumes and musical instruments are those of the Romagna, the region around Rome. The three-step invitation to dancing follows patterns of old-world courtesy and flourish. The holy couple, engaged in lively exchange, projects a definite local color. The gallantry of the kneeling farmer and the darling little angel are of a similar verve. The nativity set is a reflection about the past, the birth of Christ. The procession with baldachino, altar boys, Swiss guards and a bishop carrying the holy species reflects the present, and is the fruit of the Incarnation. Without Christmas there is no Corpus Christi. 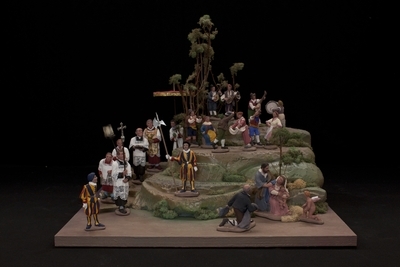 Glazed clay figures depicting the nativity of Jesus, created in Italy by Alberto Finizio. The date of creation is unknown. Exhibition label originally written by Fr. Johann G. Roten, S.M. for exhibit entitled "At The Manger" and held at Roesch Library, University of Dayton.